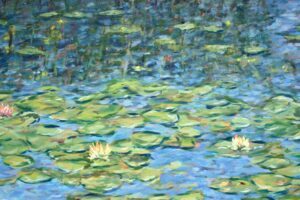 My earliest memories of looking at paintings was when I'd visit the Impressionist galleries at the Art Institute of Chicago as a child. 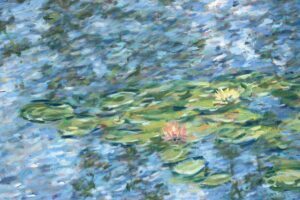 I remember a Claude Monet exhibit there during graduate school in 1975, where I was blown away by a room with curved walls displaying "Water Lilies Nymphéas" canvases that were 20 feet long. 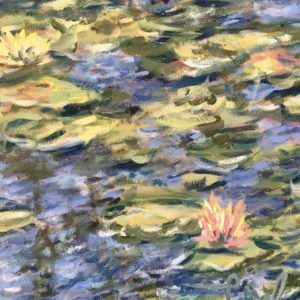 I've sat in the circular Galerie de l'Orangerie in Paris surrounded by 42-foot-long canvases, and in that city's Musée Marmottan Monet and Musé d'Orsay, as well as museums with his works in London, San Francisco, New York, Boston, Philadelphia, and elsewhere. 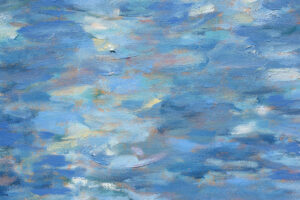 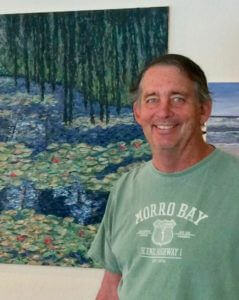 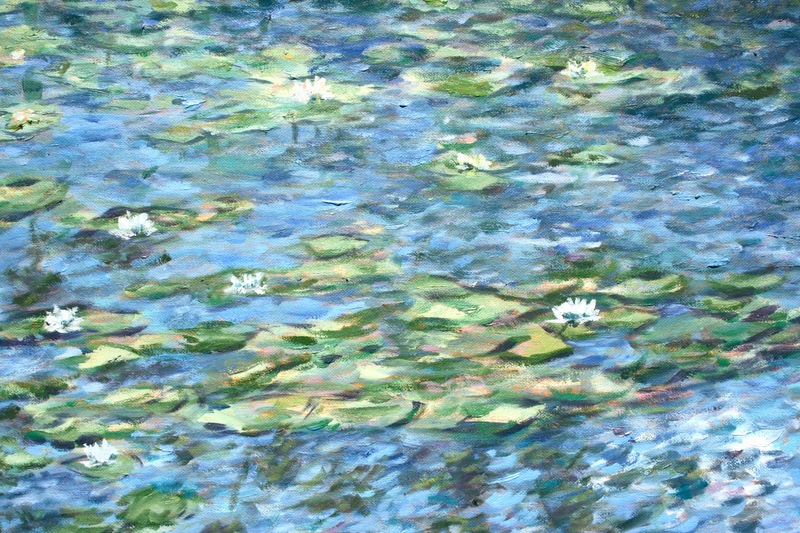 I owe tremendous inspiration to his paintings and aesthetic for capturing light on water. 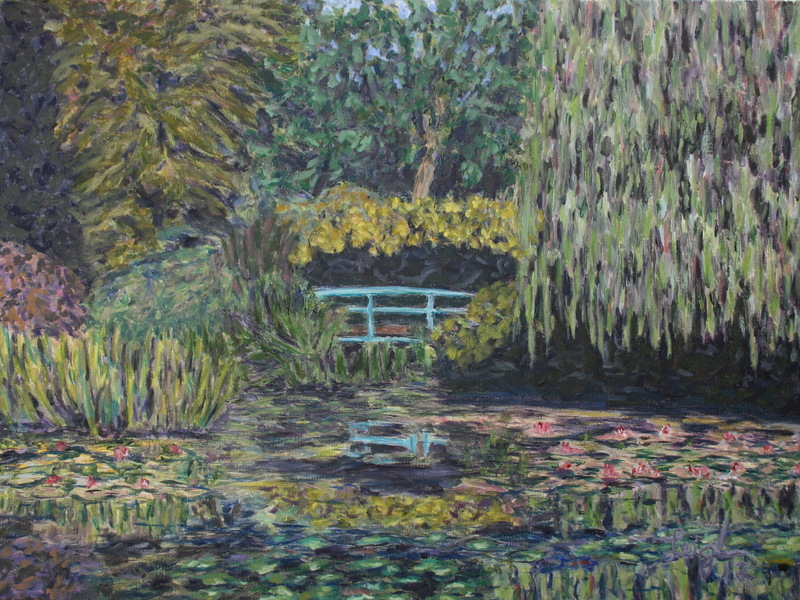 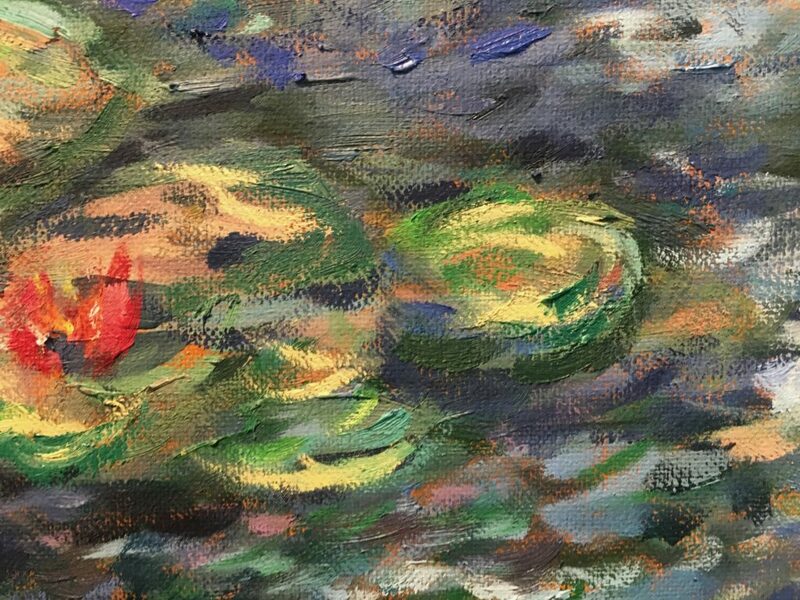 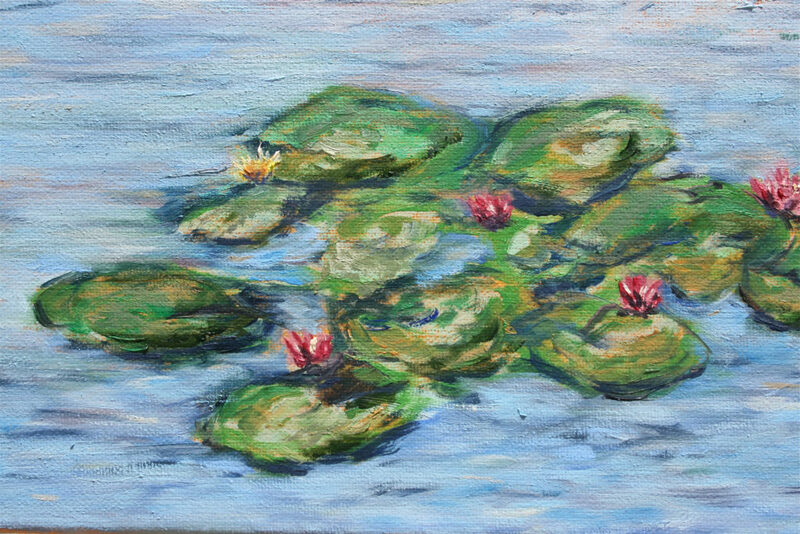 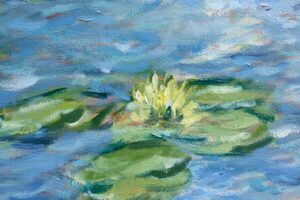 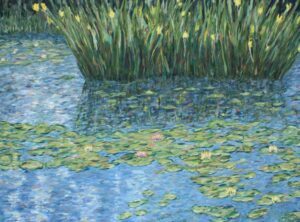 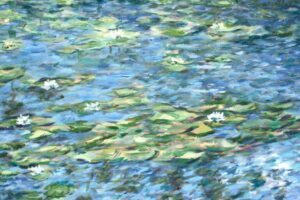 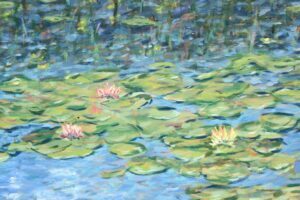 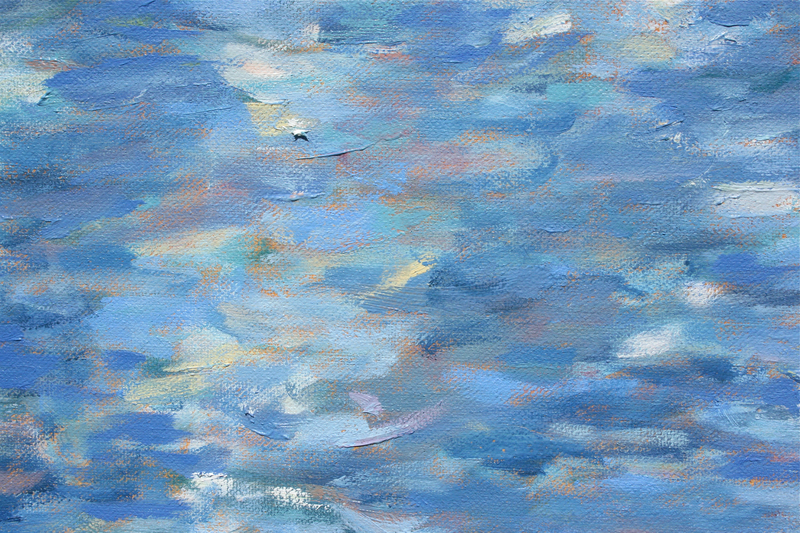 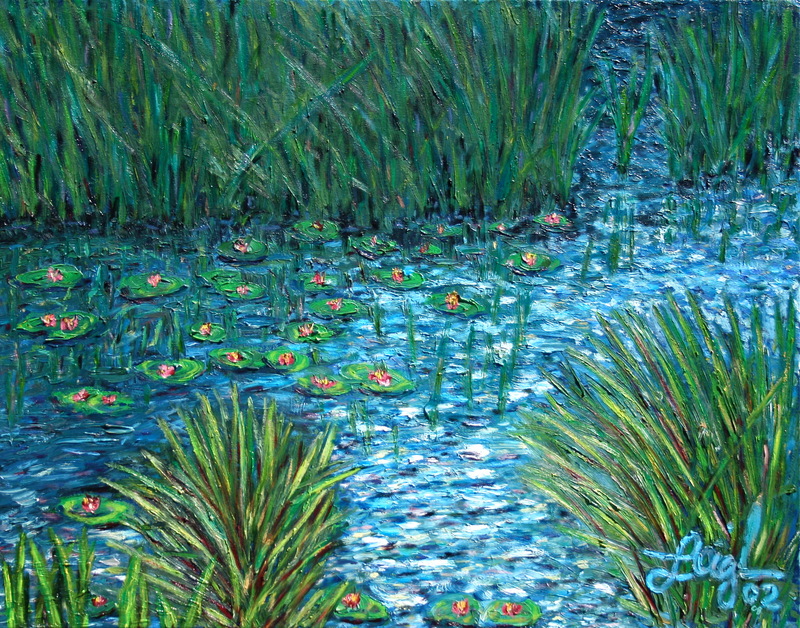 The paintings on this page are an homage to his water lilies, and many of them are based on photos I took at his lily pond in Giverny. 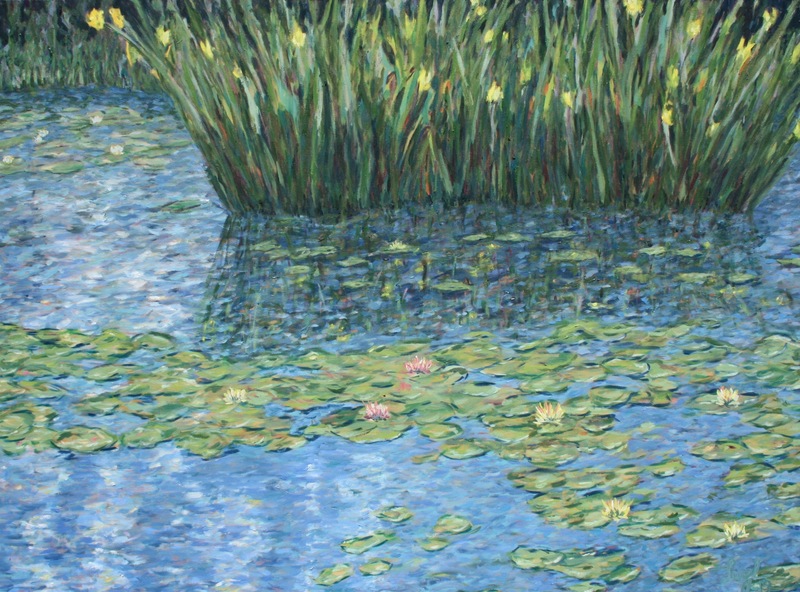 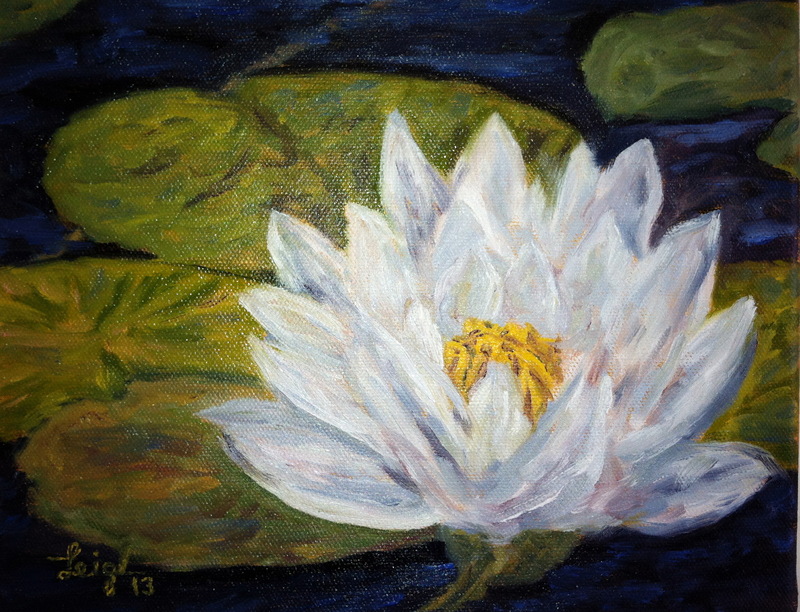 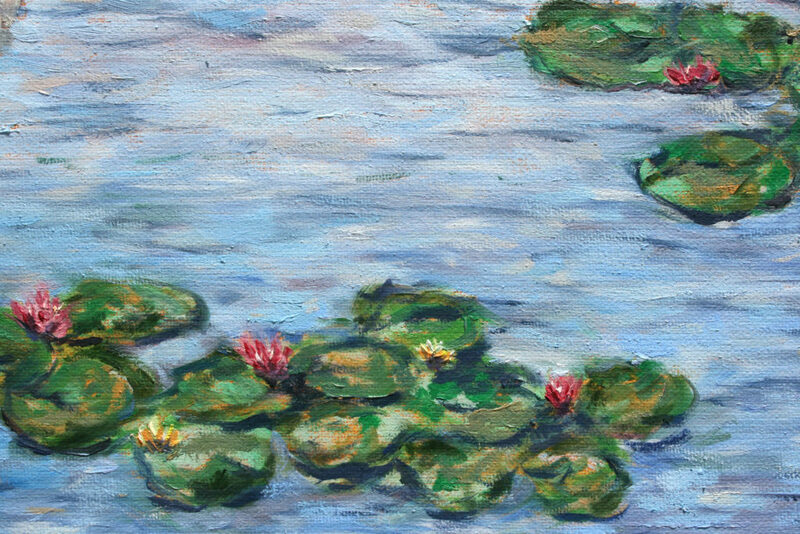 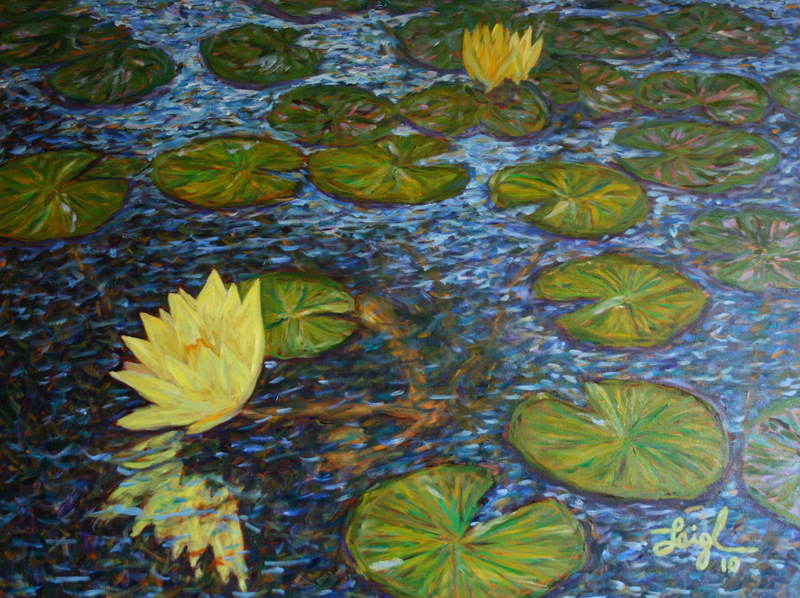 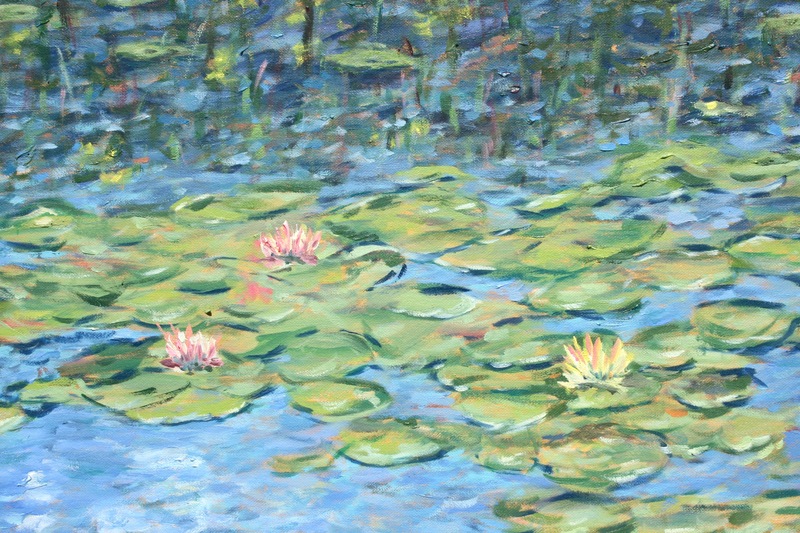 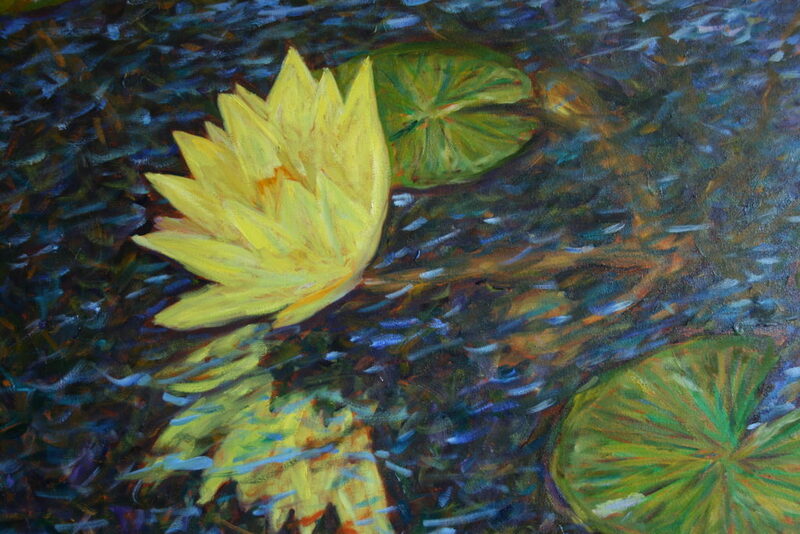 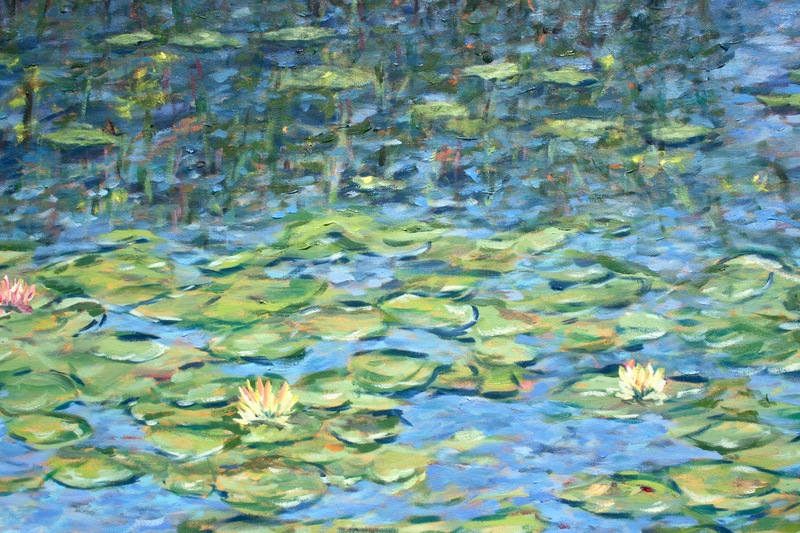 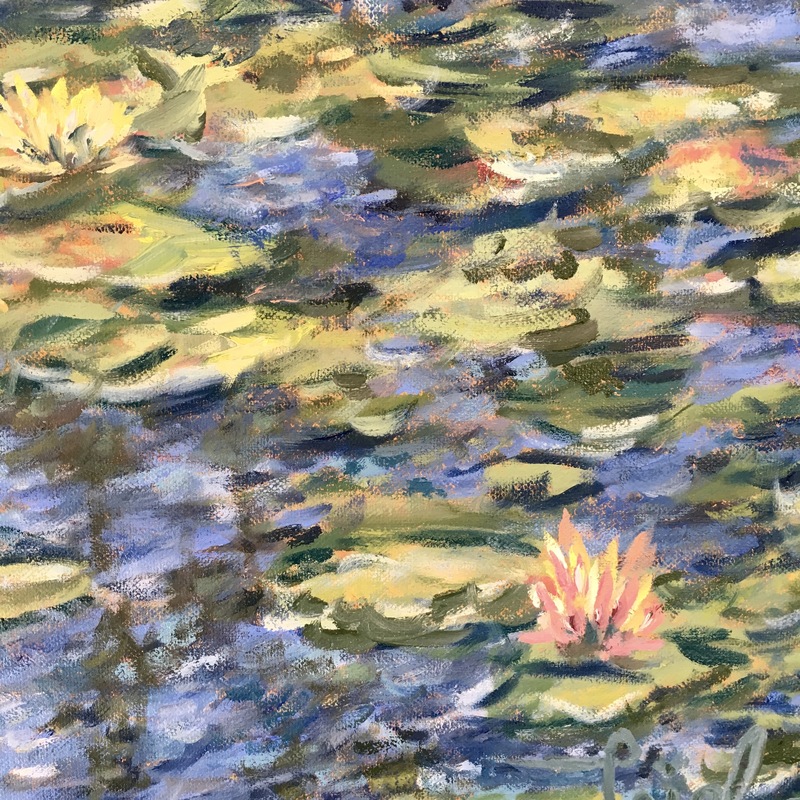 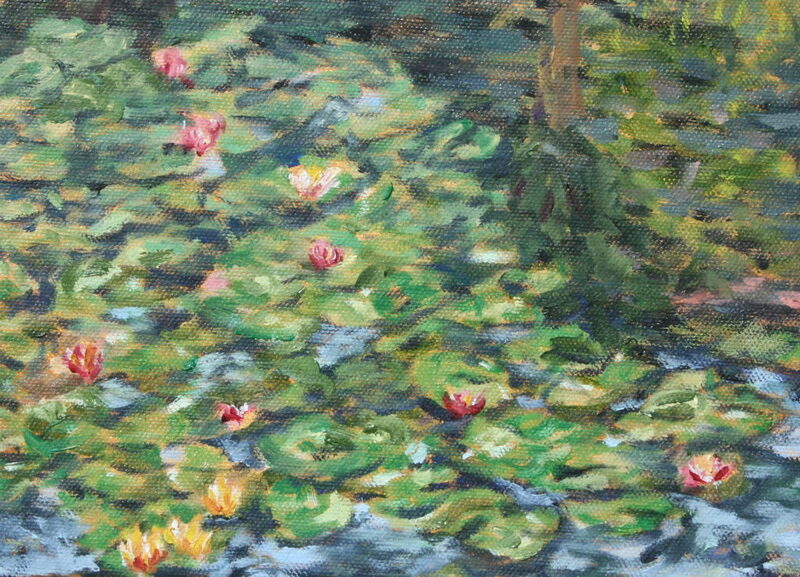 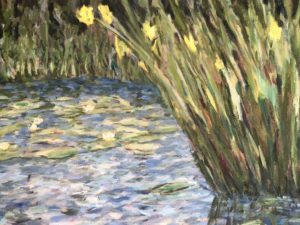 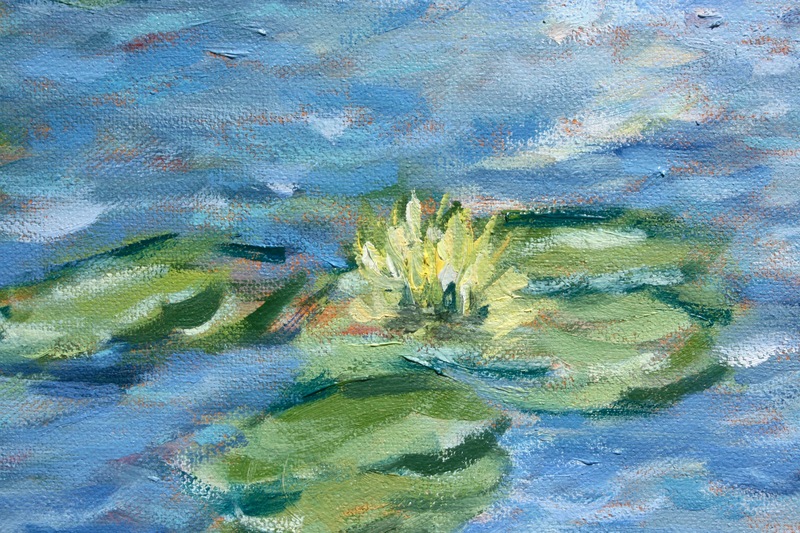 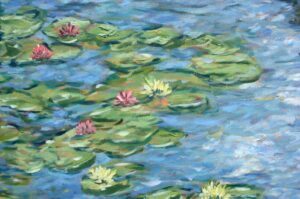 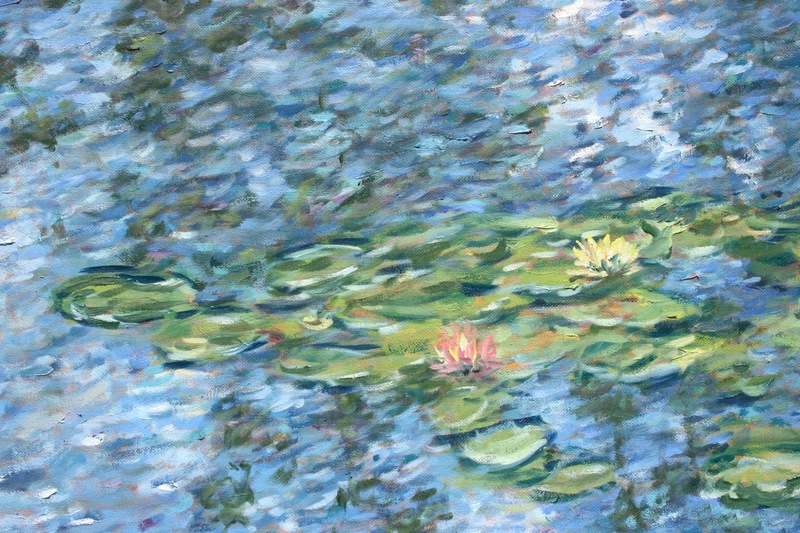 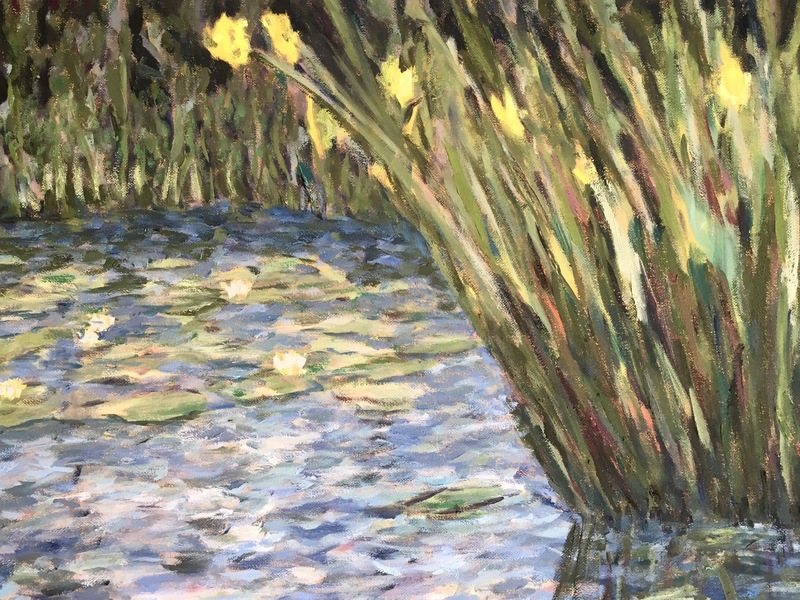 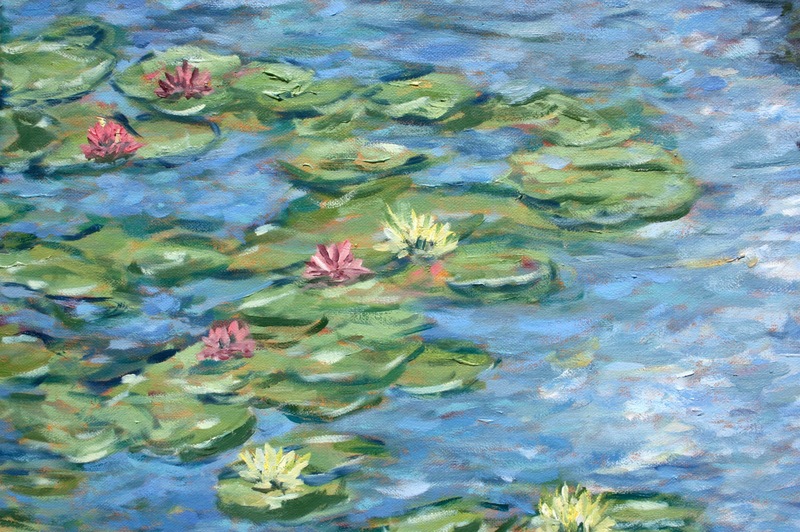 Some are included on other theme pages, and details of water lilies are taken from larger pictures (i.e., from Balboa Park). 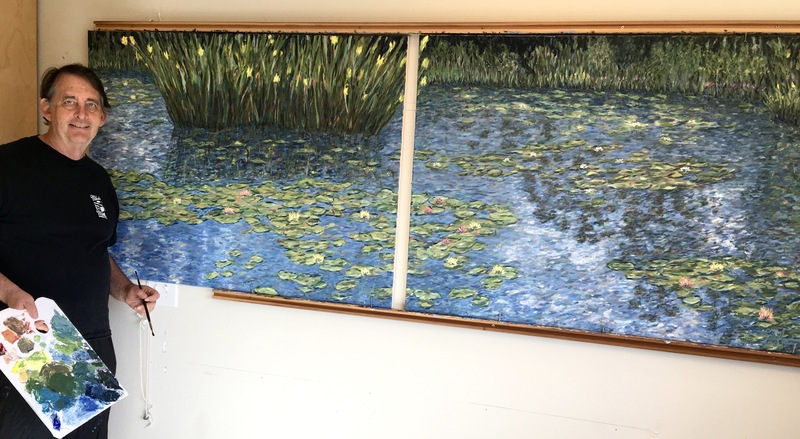 I started 2019 by finishing an 8-foot-wide diptych composition using another photo from Giverny. 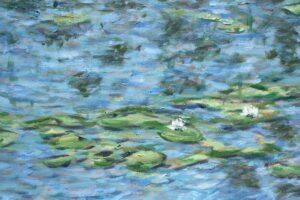 Throughout this year, my plan is to further research Monet's life and works. 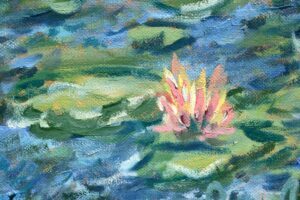 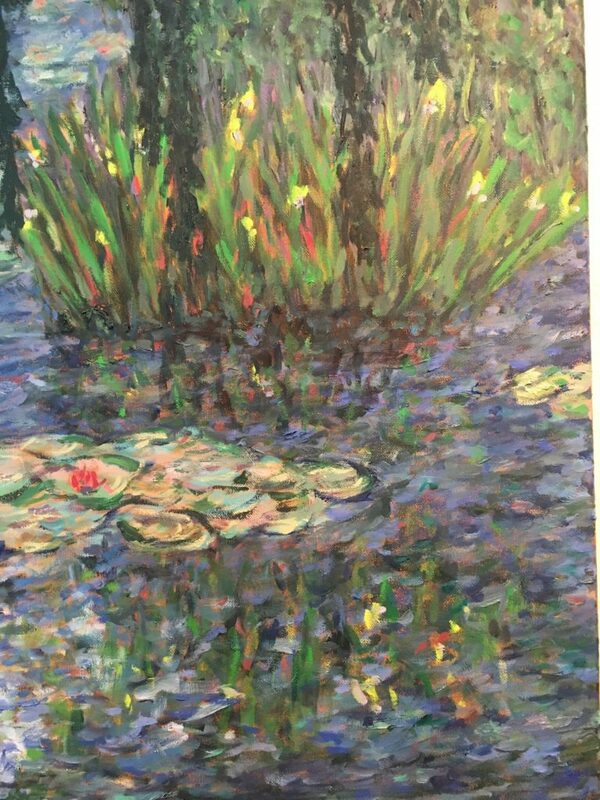 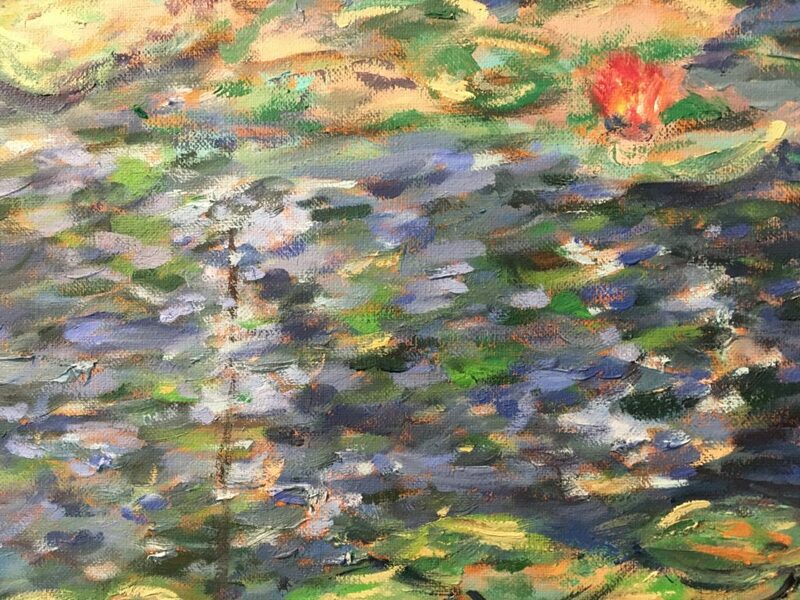 I expect to travel to San Francisco for a temporary exhibit of 20 water lily paintings and to Denver for a show with more than 100 of his canvases. 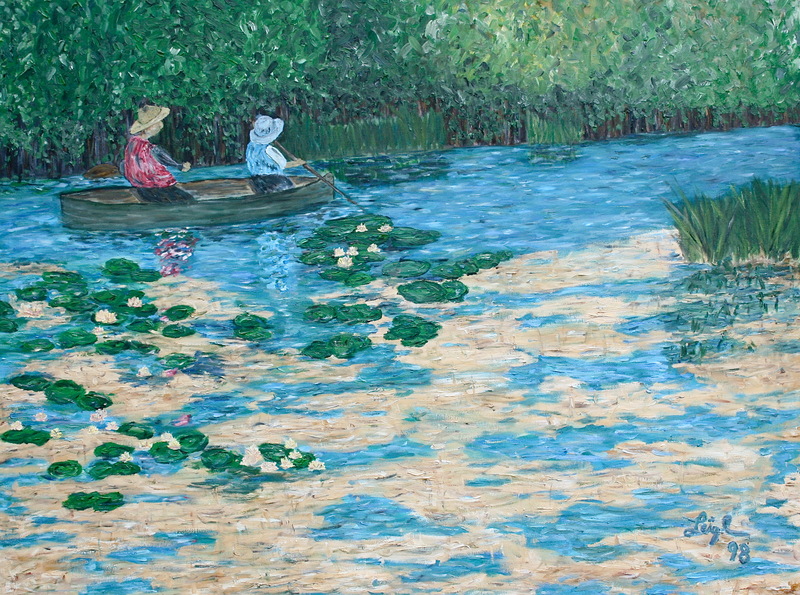 I will be reading and re-reading books and essays in my personal collection, including Ross King's superb biography of the Giverny years, Mad Enchantment: Claude Monet and the Painting of the Water Lilies, Charles F. Stuckey's comprehensive Monet: Water Lilies, and Daniel Wildenstein's authoritative, four-volume, Monet: Catalogue Raisonné. 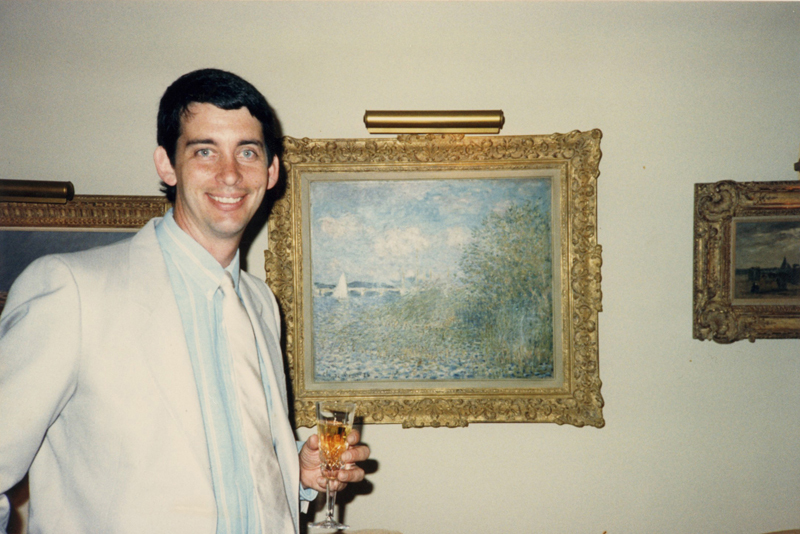 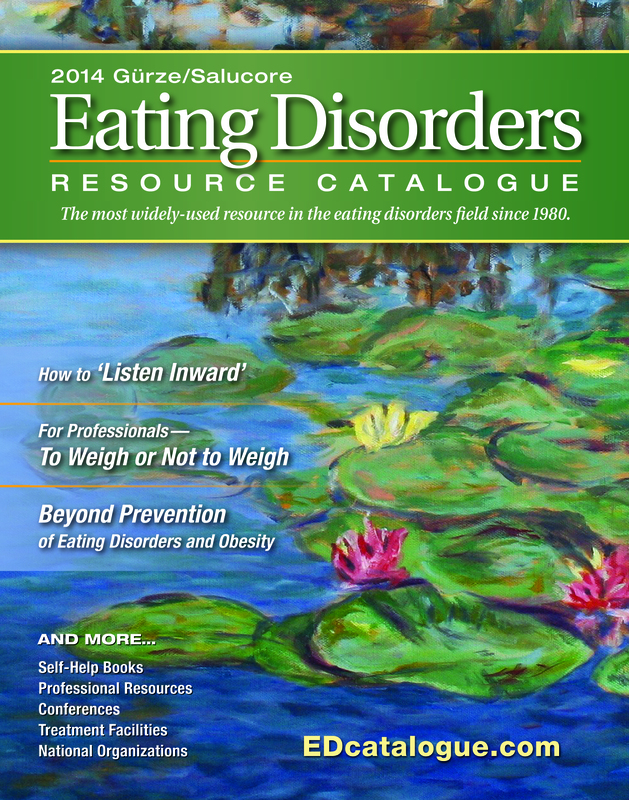 Additionally, I will be blogging about some of the things I learn.